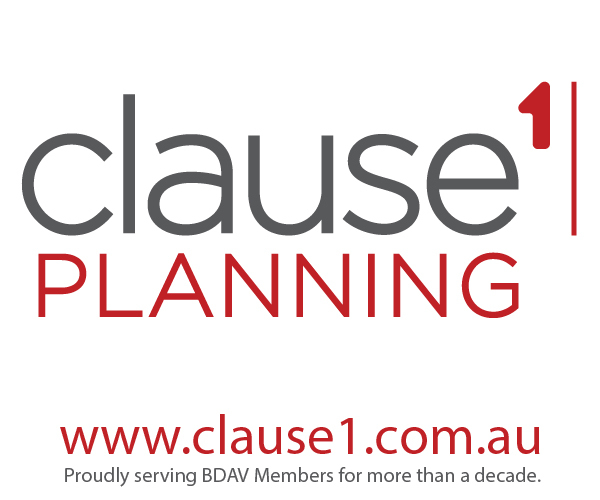 Clause 1 Planning wishes all BDAV Members a safe and prosperous 2018. We look forward to helping you grow your business and assisting you navigate the ‘ever changing world of planning’ for another 12 months. Should you have any queries in relation to the articles within this column, please do not hesitate to contact our office and discuss. Planning Scheme Amendment GC76 was prepared by the Minster for Planning and introduced on 21 December 2017. The amendments affect ten of Victoria’s metropolitan and peri-urban Planning Schemes. The changes introduce new schedules to the General Residential Zone in the Banyule, Frankston, Kingston, Knox, Maroondah, Moreland and Whittlesea planning schemes that specify a maximum building height for dwellings and residential buildings consistent with building heights contained in existing overlays that are greater than the default height in the GRZ. Regular permit applicants will be familiar with the state-wide residential zone reforms of March 2017, which set maximum building heights for dwellings and residential buildings in the GRZ. These are now replaced with varied height requirements in the schedules to the zones, in the planning schemes listed above, to reflect existing local planning controls approved prior to March 2017 (such as heights specified in Design and Development Overlays). For example, Schedule 2 to the GRZ in the Maroondah Planning Scheme sets a maximum height limit for a dwelling or residential building of 13.5 metres and 4 storeys, whereas Schedule 2 to the GRZ in the Moreland Planning Scheme is 14.5 metres and 4 storeys. The Councils affected by the above changes were included in GC76 because they agreed to the changes. We understand that the remaining Councils with similar conflicts in their height controls are continuing to work with the department to resolve those discrepancies. Amendment GC76 also amends schedules in the Neighbourhood Residential Zone (NRZ) in the Manningham, Moreland, Nillumbik and Yarra Ranges planning schemes by removing local variations in schedules which specify a maximum number of dwellings on a lot, a maximum building height of 9 metres for dwellings and residential buildings and additional height exemptions for slope or land liable to flooding. These references in local NRZ Schedules were considered either redundant or duplicating standard provisions approved in the reformed Neighbourhood Residential Zone and have been removed to reduce confusion for planning scheme users. The takeaway: applicants should review the Schedules to zones carefully to ensure a clear understanding of development opportunities and constraints, different planning schemes and schedules may have different height limits in the same zone. Planning Scheme Amendment VC138 was introduced to all Victorian Planning Schemes on 12 December 2017, and was prepared by the Minister for Planning. Clause 66.02-2 (Native vegetation – referral and notice provisions). The amendment also incorporates a new document into all planning schemes: the Guidelines for the removal, destruction or lopping of native vegetation (Department of Environment, Land, Water and Planning, 2017). Applications required under Clauses 52.16 (Native Vegetation Precinct Plan) and Clause 52.17 (Native Vegetation) must now comply with these new guidelines. improve monitoring and reporting on the implementation of the regulations. 3. Provide an offset to compensate for the biodiversity impact from the removal, destruction or lopping of native vegetation. These objectives are also found in the amended Clause 52.16 Native Vegetation Management. Changes to the Environmental Significance Overlay remove certain exemptions previously applying to Crown land, clarify vegetation removal exemptions for fire protection (fire-fighting, planned burning, fuel breaks and fire-fighting access), replaces related legislation and industry codes with a written agreement with DELWP, and introduces the term “to the minimum extent necessary” in many exemptions. Changes to the Vegetation Protection Overlay, Significant Landscape Overlay, Salinity Management Overlay and Erosion Protection Overlay have similar changes to listed exemptions. The amendment also seeks to clarify the extent to which land managers and public authorities can remove, destroy or lop native vegetation for emergency works and fire protection activities. Under Clause 52.16 Native Vegetation Precinct Plan, the changes remove numerous information requirements for a native vegetation precinct plans, permit applications, responsible authorities’ decision guidelines and the offset requirements, now simply referring to the matters set out in the Guidelines. Any conditions on a planning permit to remove, destroy or lop native vegetation under this clause must specify the offset requirement and timing to secure the offset, to provide clarity and certainty to all parties. The exemptions provided under Clause 52.16 are similar in nature to the changes to the Overlays discussed above, but include new conditional exemptions for Conservation Work and Utility installations. Changes to this clause also remove the risk-based pathways which were part of the assessment previously required, via the Permitted clearing of native vegetation – Biodiversity assessment guidelines (Department of Environment and Primary Industries, September 2013). are considered under the provisions of Clause 52.16-7 prior to 12 December 2017. The transitional provisions also apply to a planning permit lodged 12 months after 12 December 2017 where DELWP has stated in writing that a report about the proposed removal, destruction or lopping of native vegetation has been generated by the DELWP’s native vegetation information systems within 12 months before that date. The clearing along both sides of the fence when combined must not exceed 4 metres in width, except where land has already been cleared 4 metres or more along one side of the fence, then up to 1 metre can be cleared along the other side of the fence. The amendment also exempts permits for native vegetation removal/destruction/lopping by domestic stock on freehold land. The amendment does not remove or modify provisions relating to vegetation management and bushfire risk in Clauses 44.06 (Bushfire Management Overlay) or 52.47 (Planning for bushfire) as the amendment has sought to prioritise the protection of human life.